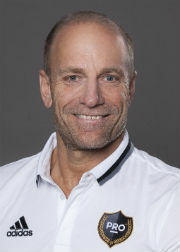 PRO’s Match Official Development Manager Brian Hall has described his first year with the Organization as ‘phenomenal’. Hall, perhaps one of the most recognised soccer referees from the United States, was appointed to the support staff at the end of 2013, charged with the responsibility of identifying and developing a group of top-level officials for the future. After almost 12 months in the job, the former World Cup official believes good progress has been made with the up-and-coming referees. “In a very short period of time we’ve identified a core group of people who have the potential to move up the PRO ranks and we’re now working closely with those officials,” Hall told proreferees.com. “This year has been phenomenal and arguably better than I thought because the individuals that we have identified are showing significant improvement. That’s the most important aspect – the continual process of improvement. “We’re always looking for new people to put on the list, and those currently on it have to continue to advance and grow. We’re identifying these people then giving them a planned, challenging approach to help them grow, learn and develop. One key component in driving improvement is the exposure to a variety of competitive games and Hall believes the officials under his guidance are blessed with the number of leagues and competitions they have the opportunity to be assigned to. With soccer in North America expanding in the coming years, the chance to experience different levels will only increase for referees aiming to reach the PRO roster. Hall also points to the partnership with U.S. Soccer and the coordinated approach to referee academies and ID events as another vital aspect in the identification and development of the second-tier match official. “The events provide top-class training and feedback to hungry officials and allow administrators to observe match officials in a focused environment over several days. We are able to see how the officials respond to the coaching and how that translates to on and off-field performance. “We’re lucky we have so many leagues to officiate in, and international teams also love to come to North America to play friendly games. That gives us the opportunity to put our officials in situations where they are going to learn and have the chance to improve and grow. “You can see that game-by-game these individuals are getting better. They’re listening, learning and they want to improve. “There’s a difference in every level that you can officiate, and the players react differently at every level. Part of our job is to translate those experiences and ensure they are ready for any situation. “I get to see real growth and impact. It’s my job to help them understand what it takes to be successful at the professional level.